This is the most beautiful and the most difficult to manufacture and calculation ladders. Required for the manufacture of bowstrings conductors. Dimensions conductors are made for the full amount of stairs and require large production areas and material costs. So we will not dwell on this detail . 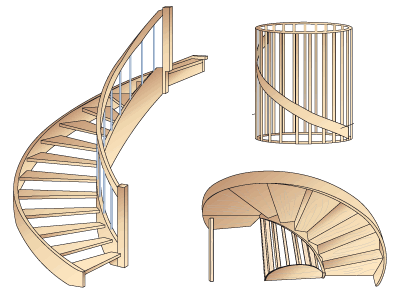 These products - for people professionally engaged in manufacturing stairs for large or enthusiasts of the woodwork. We describe only the main points. Made two conductor for external and internal string. Template for the string is placed in the inner conductor to the outer string. string size conductors position relative to each other so that between them stood stage of the same length. Then conductors using clamps made ​​of bent-glued string .Each string of glued veneer strips so that the fibers of all layers were approximately parallel. While constantly checking the parallelism with themselves. Otherwise stage, embedded in a string "will miss" by another. Should also provide allowances sizes bowstrings subsequent processing. Once the string will be ready and dried, and made steps cut into the string in the usual way. Handrails are made according to the outer conductor of the string. 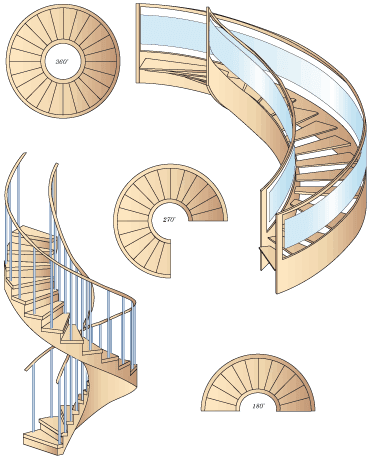 Needless to say, that the conductors and using the bending method can be made of any outline of spiral stairs and S-shaped, which by their physical, mechanical and aesthetic qualities will not yield, and in many ways surpass products made from solid wood .